I'd known this would be a hard mini to paint even before I started working on it. I had only the box artwork to follow as a reference for color scheme as there were no good pics of painted minis to be found online. Basically, he's a ranger that offers solid help with shooting and has a few traps that cost only a few soulstones. Well. at least that used to be the case with M 1.5 model. To add some twist to the model, Wyrd created this crazy forester dressed up in some rags and wearing a huge bear head trophy as a mask. He offered Guild some much needed shooting from distance and the possibility to ambush your opponent. Another little trick of his was using the cheap clockwork traps and activate them simultaneously to your opponent's models. That way, you could have the upper hand as you'd end up with your important models that haven't been activated yet. I decided to prepare a tall rock as base for him to go in line with his fluff, I wanted to make him look as if he was scouting the terrain, setting up an ambush. I used bright colors at first and then toned them down with several washes and glazes to get the worn-out, dirty look. 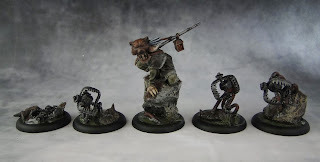 I also used dry pigments on the traps to get this rusty look. I wasn't happy with the fact that all 4 of the traps are identical and decided to make some changes. I cut a little, glued one at a different angle and used some leftovers for Pathfinder's base. Speaking of base, I went for a swampy look. I started by applying a thin layer of Gs. When it dried completely, I continued work with LGS to create some texture. After that, I painted it using a few different shades of green and ended with applying a few layers of Vallejo Still Water. You can see a better pic focusing on the bases below.